When deck builders meet roguelikes, good things happen. 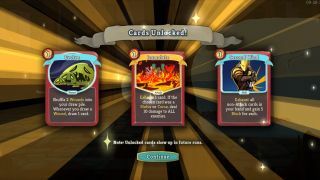 Slay the Spire is an excellent roguelike deck building game, but don't just take my word for it. Even in Early Access the game has a 10,000-strong 'overwhelmingly positive' rating on Steam, and has inspired an active subreddit and speed running community. Soon the third Early Access character will join the Ironclad and the Silent, introducing a whole new deck for the community to tear into. I called up lead designer Anthony Giovannetti—who conceptualised and built Slay the Spire with Casey Yano—to get a sense of where Slay the Spire came from, and where it's going. The two computer science majors dabbled in Flash and phone games as hobbyists before leaving their jobs to take a gamble on on this game, which is their first full-time game development project. PC Gamer: You teased a robot in one of your recent updates. Anthony Giovannetti: Sure. The new character is going to be a robot, it's going to play very differently to both the Ironclad and the Silent. It channels these orbs that it uses—these magic orbs—to power itself up and use them to great effect [you can see the orbs in the latest dev update—Tom]. It has a very different play style. Is that why you've kept this guy as the third character? It seems like there's a difficulty curve as you move through the characters. Yeah, so the Ironclad is definitely—not for everyone—but the Ironclad is I would consider the easier character. The mechanics are a bit simpler so it's easy to learn. With the Silent we increased the complexity and then with this third character there's another increase in complexity, especially because a lot of the people that are going to be playing this character, they've already played the game for lots and lots of hours. They're ready to handle something more complex. Is this the last piece of the puzzle for Slay the Spire? It is not the last piece of the puzzle. So we actually will be having more than three characters but at least for what we consider our 1.0 launch—launching out of Early Access—it will probably be the last character. After that we'll put out more characters but they won't be in the Early Access frame. Will those be paid-for updates, or free updates? We're not quite sure how we're going to handle it yet. It depends on factors like how well the game's still doing and stuff like that. Yeah, we'll see. In terms of broader design inspirations, where did you start with Slay the Spire? We started working on it about two-and-a-half years ago. I've always been a big card game player. I've played a lot of Magic growing up, a lot of Netrunner, and I've enjoyed almost all of the deckbuilding games like Dominion, Puzzle Strike, Ascension, games like that. I had this big card game background and I thought that roguelikes would pair really well with deck building games. In a roguelike you're always restarting from ground zero and in a deck building game you're always starting from ground zero again and building a new deck every time. You have a reason to be trying new things, trying out new deck combinations. Casey he's played a lot of roguelike games. He doesn't have so much of a card game past but he's played a lot of action and roguelike games. We come at it from two different perspectives and that's been a big help for Slay the Spire. It's an interesting combination because the randomisation pushes you into new directions with your deck, you're forced to adapt to what you're given. That's one of the things we really wanted. I didn't want it where you play the game and every time you build the same deck because I think it's actually pretty boring. We really wanted to push people into having to adapt on the fly. I think the relics really help with that. You might get a relic that totally changes the nature of the run. If you get Dead Branch, all of a sudden your run is likely all about exhausting now. It's going to play totally different than a run without dead branch. Are there any specific elements from the card games you grew up with you wanted to emulate or borrow? I knew that I wanted to have a constant feeling of updating your deck. I always enjoyed things like drafting in Magic. I think the most fun part of it is the actual building of your deck. But in terms of the mechanics within the combat I was for sure that we wanted a cost system for cards. In a lot of deck building games you'll just draw your hand and you'll play out your whole hand and you'll get all your resources and do stuff with them. I much more enjoy games where you have to think about how you play your hand, and there's a lot of skill in how you utilise that. That's why we have an energy system that's like mana. That's really important for allowing us to balance the game and make individual decisions in combat more interesting. How do you go about balancing the game? The community seems to be a big part of it. Balancing is very interesting. One of the tools that we use is that almost everyone that plays, they upload their game data to our servers, and then we can analyse how their game went, what cards they picked, their win rates. We get lots and lots of data on how everyone is doing—what the best cards are, what enemies are doing the most damage. We use that data as a lens to try and tweak and improve the balance of the game. Almost everyone that plays, they upload their game data to our servers, and then we can analyse how their game went, what cards they picked, their win rates. It's a big part of it because we try to make evidence-based decisions. I'm really big on data-driven analysis, but at the same time it can't show you the whole story because there's a lot of things that are maybe conflated with something else, and so you're being driven to a misleading conclusion, or the data can't show you how fun a given part is, so we also still play the game a lot and try to get a raw feel for it. In addition to that we try to pay attention to the community to see what they're actually saying. I read our subreddit pretty much every day, make sure I go over most of the posts. We have an official Discord and people talk in that and we have a bot setup so if anyone has a bug or they have feedback they can just say it and the bot will collect it. We use all of that to holistically help us figure out what we think, and then find out what's the data to balance it. It's by no means perfect at all. Part of why we did this data-driven approach is because I have this big experience with card games in the past. I told Casey early on that we're going to have hundreds of cards, plus we have all these relics interacting with everything. There's no way that just the two of us can possibly balance this all correctly. We're going to need to develop a system that allows us to get closer to a good state of balance. A big part of that was before we even launched in Early Access we had set up these systems and our internal playtesters were playing a lot, and they were giving us that initial data to seed things and help us balance it. Do your regular players almost always beat the game? No. Definitely not. The win percentage for an average player fluctuates based on character and the current state of the balance but it's not that high, but that's intentional. We want it to be pretty skill-based. If you jump in on your first time and you're like 'this is the easiest game ever' that wouldn't be very satisfying. We want you to feel like you learn and get better and make progress. But we also track how long you've been playing for and stuff like that. We can see that as people play more they do get better over time, and the win rates do go up a lot. However the average win rate is still pretty low but when you get the super good players they can have win rates that are incredibly high. I've been enjoying watching speed runs on Twitch. There’s a pretty active community there. I've always enjoyed speed running, I've never been any good at it, but I've enjoyed watching it. I remember back in high school watching some early speed runners, so I was really excited when that community started up round our game. Both Casey and I really like speed runs, and we've actually tried to foster and help them grow. We have a channel in our Discord for the speed runners, anyone can come in and give input there. Even though I can win 100% of the games I play I cannot go even close to that fast so it's just good to see people doing these things that I cannot even come close to. An example of this is that at one point we were making an event called The Secret Portal. Basically it can show up in Act 3 and it's an event that can immediately send you to the boss. It was in our beta branch and the speed runners were saying 'well, we don't really like this event because if you're speed running the difference between getting this event and not is astronomical. It can skip a huge portion of the act. We made it so that event will only show up if you've been playing it for at least 15 minutes. If you're a speed runner it's not affecting you because they're way under 15 minutes, but if you're a regular player it's also not going to affect you because you're probably not in Act 3 at the 15-minute mark. We ran that solution by them, they really liked it, we implemented it, and it's been popular. I've been happy watching the speed runners get faster and faster. It's pretty crazy, I've been playing this game a lot, and when we push out an update or something I've played that at least a couple of times to make sure that nothing's broken, and even though I can win 100% of the games I play I cannot go even close to that fast so it's just good to see people doing these things that I cannot even come close to. I'm addicted to the daily challenges at the moment, particularly the way they unbalance the game in entertaining ways. I went back to the drawing board and I was like 'why don't we, instead of making this just an extra hard mode which we already have ascension for, why don't we focus more on these interesting modifiers that bring new experiences to the game, really focus on that, ramp those up, see how that goes.’ I went back, changed the modifiers, changed some of the underlying systems and almost instantaneously people were loving it, saying how much better it was. We've kept it that way ever since. We're slowly adding more mods. I have more planned, but yeah I think it's been a big hit. It's a good example of the Early Access process being very useful for improving the game. If we were just releasing and saying 'this is how dailies are, here's the whole game' that wouldn't have been improved. Instead I was able to listen to the feedback and iterate upon it really quickly and improve it to what it's currently at. Are there any particular cards or strats that you particularly like? I would say that the deck I enjoy the most is still the exhaust-heavy deck, with corruption in particular, because of how much it completely forces you to reevaluate cards. It's a card that changed a lot over the internal data process. Corruption is a 3-cost power that make all your skills free but they exhaust when they're played. It used to actually be much better than that, which is crazy, because it's a strong card as-is. Early on, we weren't quite sure about things, was forcing your cards to exhaust a good thing or a bad thing? Maybe it's a bad thing, so we gave it some additional upsides as well and quickly found out that it was completely degenerate and needed completely changing. I really like it in its current state. Slay the Spire is currently in Early Access. The third robot character is heading to beta branch this week.